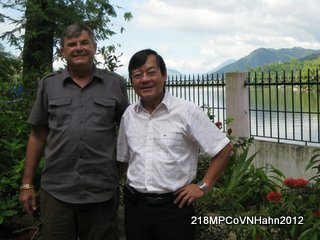 Please send us any information you have pertaining to reunions for 218th MP Co in Vietnam veterans. Check our Reunions pages for any information on that in the future. Meanwhile if you have photos of 218th MP Co small or large groups reunited after service in Vietnam please send us a copy so we can post them here. 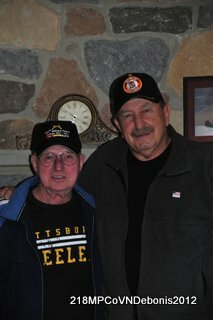 (Above & Left) Ed Short (L) and Mike Debonis (R) at Ed's daughter's home in PA, Nov '12. 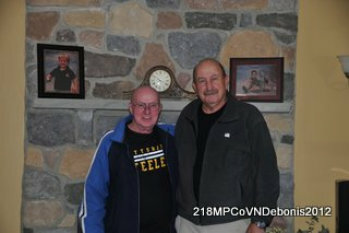 Both Ed and Mike served in the 218th MP Co and 178th PMO in '68 - '69. 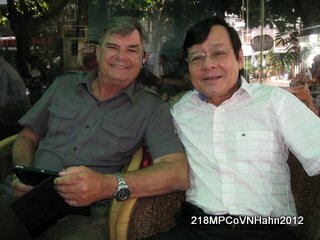 (Above) Jim Berlin (L) and QC Phan Hahn are pictured here at Jim's house in Nha Trang, VN, Nov '12. 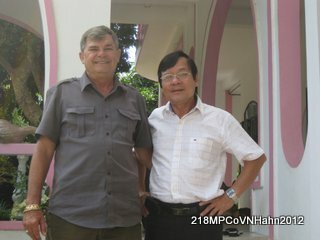 (Left) QC Hahn visited James Berlin at Jim's home in Nha Trang, VN. 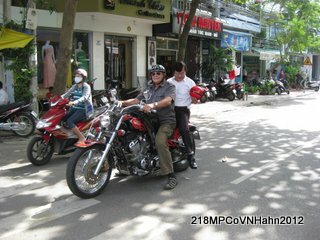 Part of the visit included a tour of the streets of Nha Trang on Jim's bike. No doubt they visited many of the sites we all remember from years ago. Nov '12. Click on the smaller pics below to enlarge. This website is not approved or endorsed by, nor in any way affiliated with, the Department of Defense or the US Army Military Police Corps. 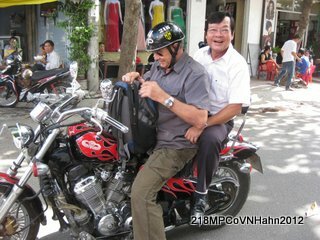 Copyright 2008-2013, The 218th Military Police Co in Vietnam, all rights to reproduction in whole or in part without express written consent is prohibited.